Wood Green in the South, Edmonton in the East and Winchmore Hill in the North. It is connected to Central London as well as areas outside of the capital by the Great Northern Rail Services stopping at Palmers Green station. There are no Tube service running through N13 however the Bounds Green and Arnos Grove stations are relatively easily accessible for the residents of N13 living close to it's western border. These tube station have the Piccadilly line running through them which is very convenient for anyone looking to travel anywhere central or even the Heathrow Airport. Even though N13 is geographically quite removed from Central London it doesn't have that many green areas within it's borders. Boomfield Park, Tatem Park Recreation Ground and Tile Kiln Lane Open Space form the majority of parks and green area in Palmers Green. Similar to the tube services however some fantastic parks can be found right on the postcode border. Firs Farm Wetlands Park, Arnos Park, Grovelands Park and Pymmes Park are all easily accessible and generally either exactly on the border or within a five minute walking distance from it. As such then the N13 postcode can provide the locals with a great quality of life at a reasonable living cost compared to other parts of London. Palmers Green is well known for it's Greek and Cypriot population. Sometimes being lovingly nicknamed either Little Cyprus or Palmers Greek. The income levels in N13 are generally in line with the London average. Some 60% of the households are one person households or couples without children and pretty much the only demographic anomaly we can find here is the fact that the under 18 age groups is slightly under-represented compared to London as a whole. The properties in N13 are basically exclusively houses rather than flats or larger apartment buildings. This provides a great opportunity for leaflet distribution since buildings of the type that can be found here are ideal for leaflet distribution. They don't pose any challenges with the deliveries themselves and thanks to the uniform nature of many of the streets here it becomes easy to segment the postcode into delivery areas based on the types of demographics one might like to target. Most of the houses here are Victorian Terraced homes very often with gardens. As such N13 can sometimes be overlooked by companies looking to run campaigns in North London providing services connected with the gardens and homes. 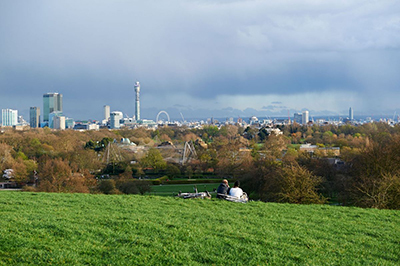 Since it doesn't have the affluence levels of Highgate or Hampstead it can easily go under the radar as one of the best places to run a leaflet distribution campaign for a business providing services that have to do with the home or garden. All that is needed to confirm this is one look at the satellite view on Google Maps and it becomes obvious that there are thousands upon thousands of houses with gardens to be targetted here. For more info please see our home page.